One of the best parts of going to Hawaii is the constant access to fruity little drinks that come adorned with pieces of ripe fruit, a fresh flower, or a tiny paper umbrella. Although, to be completely honest, I'm mostly a water drinker and ordering anything else is a super rare indulgence. It's Aaron who loves the fruity girl drinks (and he'll totally admit to it. No shame). Our first full day in Hawaii we had lunch at this restaurant with fantastic patio seating overlooking Kona Bay. We'd just spent a couple hours at the beach and in the sun and were all dying for something to drink. My parents and sister ordered their standard diet Cokes, I got water, and Aaron ordered...fruit punch. I immediately thought, "...ew." But when it arrived and I stole a sip, I was surprised to find that it tasted nothing like the red syrupy junk I had grown up with. 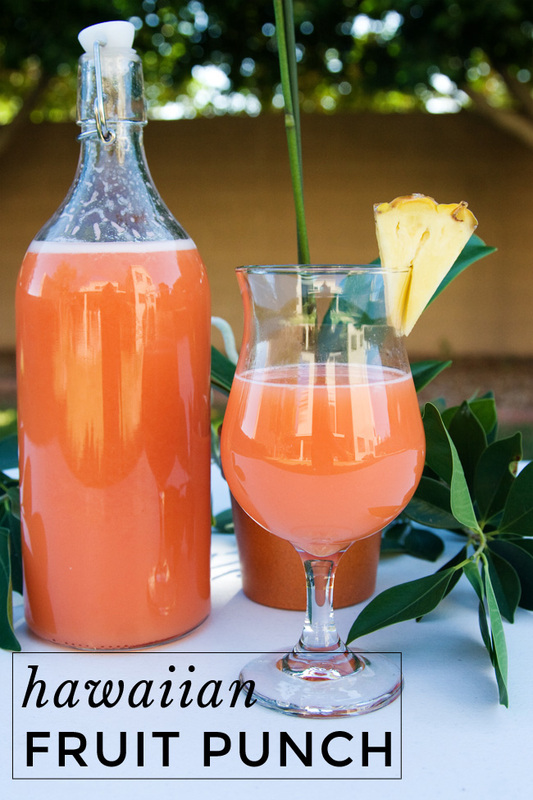 Real Hawaiian fruit punch is bright with the flavors of tropical fruit. It's sweet but not overpoweringly so. It is so so so much better than the stuff you had at class parties in elementary school. I had a hard time finding real guava juice...mostly because I accidentally bought mango juice instead. So I ended up having to go back out to the smaller grocery store by my house, which only had guava nectar. Not exactly the same thing but the results were still completely delicious. Mix together first four ingredients and refrigerate. 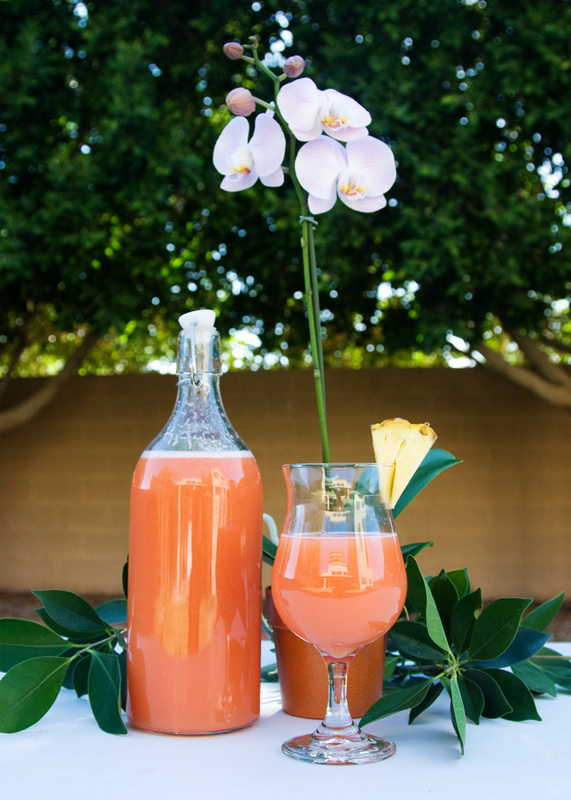 When you're ready to serve, pour a splash of Sprite into your glass then top it off with the juice mixture. 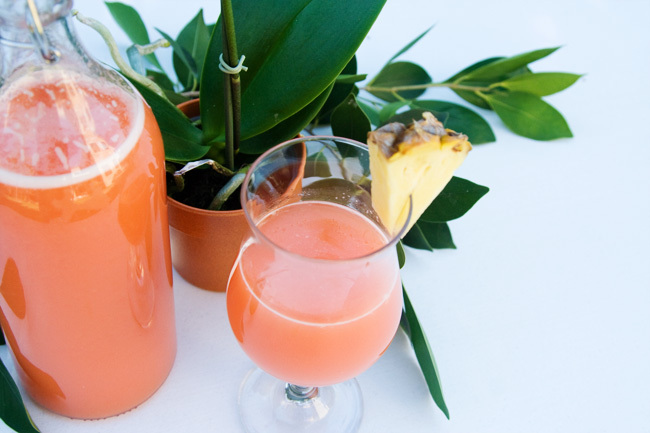 We served this to a bunch of pregnant people and non-drinkers, but if you like your drink a little more grown-up, you can add a couple cups of rum. I also love to add a squeeze of lime to mine! Want more recipes for Hawaiian treats? How about these malasadas or perhaps some chocolate haupia pie? Find all my favorite recipes on Pinterest! I'm going to try this out soon! When we stayed at the Hilton in Waikiki, I visited their lobby multiple times a day JUST to get a cup of the delicious juice! I think this might be similar! This looks delicious!!! What a great summer drink.